I thought I would share the key graphics and information from the synopsis report of the Zero Carbon Australia plan by Beyond Zero Emissions (BZE). 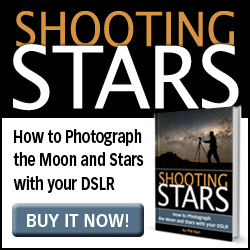 Note also the launch of the full report in Melbourne on 14th July. The Zero Carbon Australia report attempts to tackle head-on some of the arguments against renewables and to show that they can make much more than a niche contribution to total energy demand. 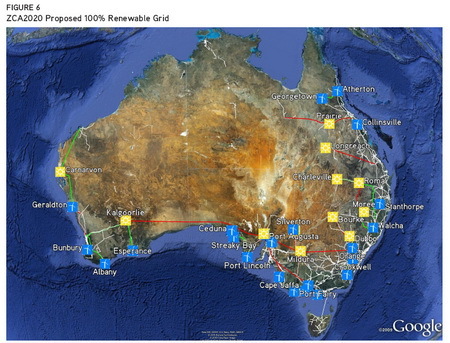 With a target of 100% renewable energy by 2020, clearly this is an ambitious report. While no one suggests this is probable under politics as usual, it shows what might be possible if we are prepared to take a radically new approach. In the peak oil sphere, there is significant concern about energy return from renewable energy projects. While this report does not explicitly use the term 'Energy Return on Energy Invested' (EROEI), it does provide the numbers for steel and concrete use required to deliver the plan against the current volume of use in Australia. We could get a lot more utility out of those resoures than we do at the moment. 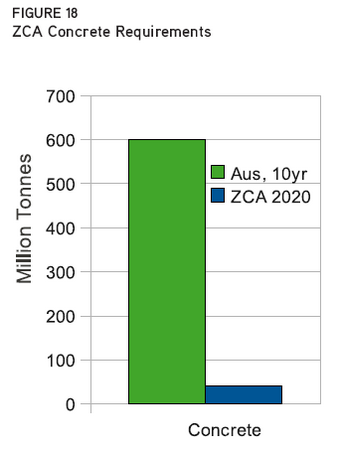 The ZCA2020 Plan shows that with a combination of energy efficiency, fuel-switching from gas and oil to electrified energy services, then using a combination of commercially available renewable energy technologies, Australia’s energy needs can be met with 100% renewables. 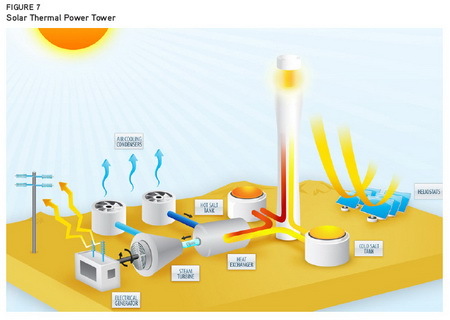 Wind and Concentrating Solar Thermal (CST) with Molten Salt Storage are the two primary technologies used, with some backup from biomass and existing hydro. Under the ZCA2020 Plan, it is projected that 2020 grid electricity demand will be over 40% higher than today, from 228TWh/yr up to 325TWh/yr. This increase in electricity demand is due largely to the switch of services currently provided by gas and oil to be supplied more efficiently with, renewable electricity. The increase is significantly offset by ambitious but achievable electrical energy efficient targets. To meet this demand, a combination of wind and solar thermal with storage are proposed as the primary electricity generation technologies. Biomass and hydro are utilised as backup, supplying about 2% of annual electricity. 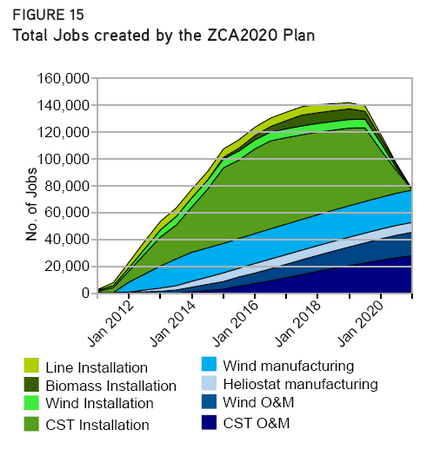 The ZCA2020 electricity generation mix has been quantitatively modelled in high detail using real-world data, with the results demonstrating that Australia’s electricity demand can be met by 100% renewable energy. 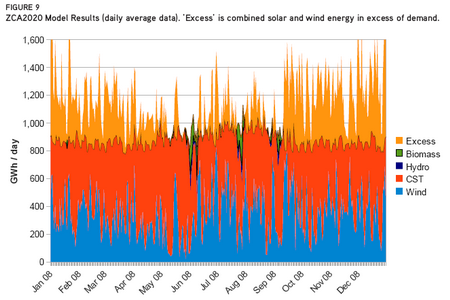 The data underlying the model are derived from real meteorological recordings of solar insolation at the 12 proposed CST sites, real wind speeds at existing wind farms, and grid demand based on actual demand in the National Electricity Market (NEM). Modelling has been performed on a half-hourly timescale for the years 2008 and 2009. The Plan’s proposed combination of 42.5 GW of CST and 50 GW of wind provides enough energy to cover 98% of the electricity demand modelled, with the remaining 2% being supplied by existing hydro power (5 GW) and heat from biomass co-firing on 10 GW of the CST plants. This is represented by the small green and navy blue areas in Figure 9. The ten-year timeline proposed by The Plan projects a gradual scale-up of the renewable industry that would see most of the proposed infrastructure completed in the second half of the decade. Fast-track of permitting and planning approvals will be required. The CST plants are modular, and once the design and planning for the first plant is complete then the process becomes one of replication on each of the 12 sites. Construction thus becomes progressively faster in the later stages as companies gain experience and become more efficient. 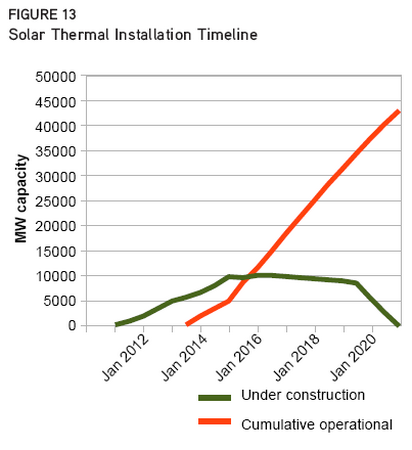 Current power tower projects have a construction time of 2-2.5 years, though more mature parabolic trough projects are being completed in 1.5 years. 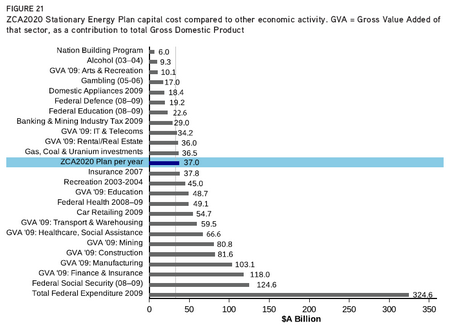 Australia is an energy-intensive country, both in terms of energy consumption per capita and per dollar of Gross Domestic Product (GDP). 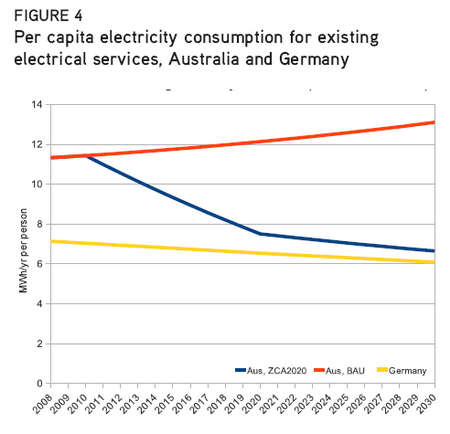 An efficiency gain of 33% per capita is forecast for current-use energy services, an achievable target that will bring Australia in line with other modern economies. At election time, you can always rely on mainstream parties to rattle the 'we'll get tough on drugs and crime' can. Equally, when renewable energy is up for debate, you can rely on the same parties to suddenly be concerned about loss of jobs in the coal industry, jobs which they have never at any other time displayed any concern for. Of course, that still leaves some large communities vulnerable which will require great care to manage during the transition. But building new energy infrastructure is not going to lead to net loss of jobs. While not often a concern in the mainstream, peak oil folks are painfully aware that renewable energy does not come with the same fantastic rate of energy return as the good old days of conventional oil. But short of a rapid collapse scenario, if we're going to have some kind of economy for the next decade or two, we can choose to have a few less bridges, stadiums and skyscrapers in the pursuit of renewable energy infrastructure. A few significant sacrifices may be required, but the building materials are available if we choose to invest them in such infrastructure. 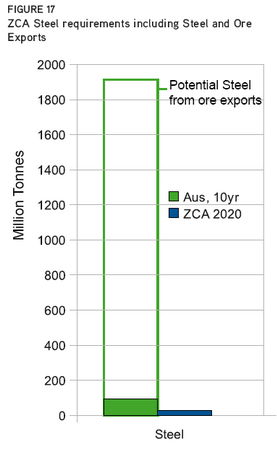 The requirement for concrete amounts to 7% of Australia’s production over the 10 year timescale. The requirement for steel is 20-30% of Australia’s domestic production, but only 1.3% of Australia’s total of iron ore exports and steel production. The main components of heliostat mirrors are glass and silver. 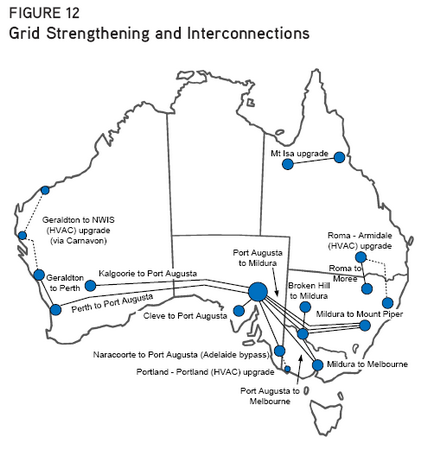 The glass required is larger than Australia’s production, but the demand can be met either by building one or two glass factories, or by imports. Silver is used as the reflective material in the mirror and a thin film is used on the back of the glass. 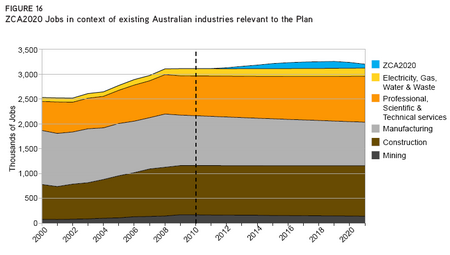 The silver requirements are very low with the Plan requiring less than 2% of Australia’s total production. Given their target audience, BZE understandably rely on some conventional economic comparisons to show that while the Zero Carbon Plan is certainly expensive, it is still 'affordable' compared to other sectors of the economy and Government expenditure. As an engineer who has worked on energy and utility infrastructure for nearly ten years, I believe it is possible to build renewable energy on a very large scale. Some radical changes in the political landscape will be required, but I do not fear the technical challenges required to deliver something as audacious as the Zero Carbon Australia plan. I am however concerned that our economic and financial systems are in serious trouble. Will the end of a 70 year credit cycle be enough to halt even willing Government's from such a grand plan? I hope not. 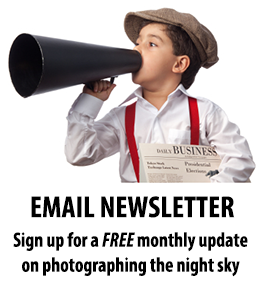 You can contact Beyond Zero Emissions, the authors of the Zero Carbon Australia plan here.